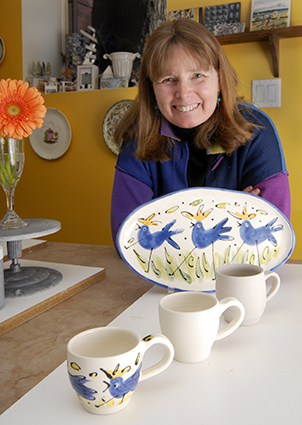 Art workshops are set for this weekend at the Beach studio of ceramic artist Karen Franzen. If you’re looking for an opportunity to make new friends or learn a new skill, even an activity to do on a date or with your children, a local artist is offering a number of upcoming creative workshops. Ceramic artist Karen Franzen is hosting a wide range of workshops for everyone to enjoy over the next few days and months; from basket weaving and needle felting to photography and pottery making. Franzen’s, Studio Under the Trees (3 Wembley Dr.), sits atop the Williamson Ravine and is filled with years of her ceramic creations. It can get lonely for an artist working in their studio, and that inspired Franzen to get in touch with other creators from various fields and friends she’s made over her 30 years as a ceramics artist to start workshops that she would host in her studio. A graduate of Ontario College of Art and Design in Ceramics and Textile Design, Franzen is known for her bright use of colours such as blues and yellows. Her playful work is inspired from children’s illustrators and artists such as Paul Cézanne, Nicoli Ingrid and even her father, Fred Franzen, a Toronto-based artist. Franzen uses humour and story-telling in her work, creating a wide-range of playful bowls, teapots, mugs, vases and tiles. She also creates custom pottery work. The workshops are enjoyable, Franzen said, and it’s always nice to try something new. She also offers summer workshops for children, beginner and intermediate pottery classes, and tile painting classes. Ceramic enthusiasts can also buy Franzen’s works year round at the Blue Crow Gallery in Toronto and at Meta4 Gallery in Port Perry. The next scheduled workshops are jewellery making led by Louisa LaBarbera on Saturday, March 23 from 10 a.m. to 1 p.m., and photography with Kartrin Faridani on March 24, 10 a.m. to 1 p.m. Both workshops are $45, not including material fees. Franzen will also be present at the Bowmore Make It Fair on April 13.